More often than not, if your home is equipped with a garbage disposal, you have probably had trouble with it once or twice. Garbage disposals are essentially to be used for left over food waste, but seem to be used too often for the destruction of entire left over food portions, which is normally the result of children thinking that the disposal is meant to make unwanted food disappear. Whatever the case, we can get your kitchen’s Garbage Disposal functioning correctly. 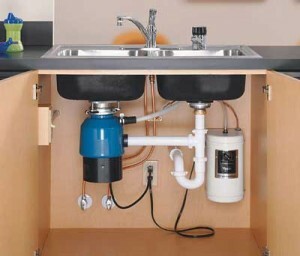 The purchase of a new garbage disposal unit is an option for your kitchen. The purpose is to grind food into small pieces that will wash down the drain. Food that is sent down a drain will flow into the sewer or into a septic system. A local plumber is needed to install a new garbage disposal to the sink that is in your kitchen. Garbage disposal installation is a service that is provided by AmeriServe. There are many benefits to using a garbage disposal in your kitchen. One benefit is that the kitchen will smell better because you will not need to put any food in a garbage can or other refuse container. If you install a garbage disposal unit, then you will have less trash as a result. You will also have less mess if a disposal is handy because you can rinse off dirty dishes in the sink. One reason that a professional plumber should install a garbage disposal is to ensure that no disruptions occur with the pipes. A new line needs to be added from the garbage disposal to the drain line that is for your sink. If you are replacing an old garbage disposal, then then plumber will need to first take out the old unit before installing the new device. Home owners that try to remove a garbage disposal on their own may end up cracking the drain line. If the drain line is cracked, then it will be a costly repair. A cracked pipe that you do not know about is the easiest way for mold to grow. You may also not know the proper way to connect a trap to the drain pipe under the sink. The outlet pipe on an existing garbage disposal needs to be removed before the unit is removed, This is not a job that a novice can easily perform. A professional plumber is better suited to perform the task of removing and installing a garbage disposal. Plumbers putty is used on the sink ring. This putty needs to be removed in order to install the new unit. Contact AmeriServe today if you need a plumber to install a new garbage disposal. We provide service in Allentown, Bethlehem, a Easton, Pennsylvannia and Phillipsburg, New Jersey and the surrounding communities.